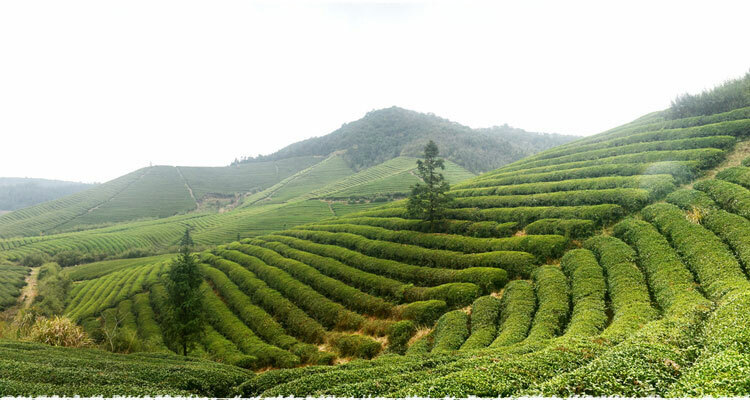 Beautiful countryside and exquisite tea plantations can be viewed in West Lake Hangzhou, the home of the famous green tea named Dragon Well Green Tea, a Chinese green tea with delicious flavor and aroma and a history of being grown in this area for thousands of years. What Does Dry Dragon Well Tea Look Like? 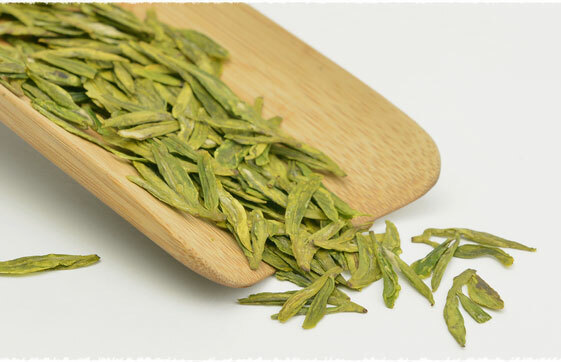 The dry leaves of Dragon Well Green tea have a smooth, flat and spear-like appearance. And the higher grade Dragon Well is more beautiful. 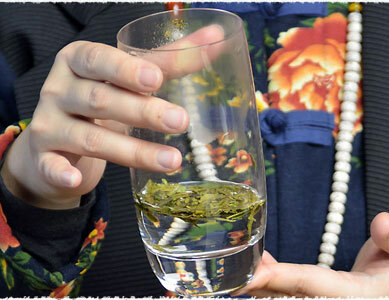 Dragon Well Green tea has a refreshing taste, with a fresh and mellow fragrance. 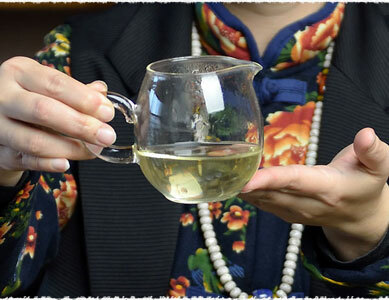 The tea liquid is lovely pale bright greenish-gold color. 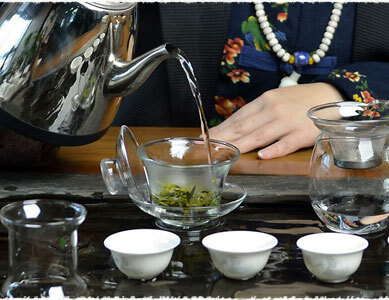 To truly enjoy your Dragon Well Green tea, you’d better choose either a nice glass cup or a gaiwan to brew your tea, then you can see the beauty of the leaves as they dance and unfurl in the water at the same of enjoy the taste and aroma. 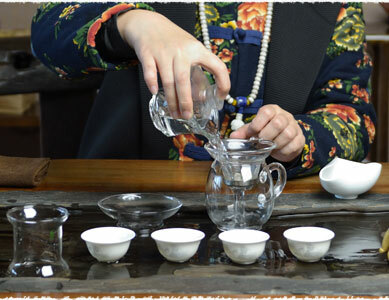 Preparation: Glass, tea holder, fair cup, cups, filter, and tea ceremony set (tea scoop, tea tweezer, tea pin, tea spoon, tea funnel and tea container). Step 1. 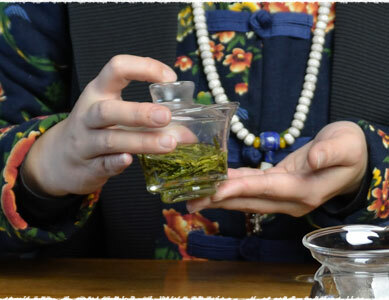 Take tea: Use a tea scoop to take 2 grams Dragon Well Green Tea from your tea tin (or bag), then put tea into tea holder. Step 2. 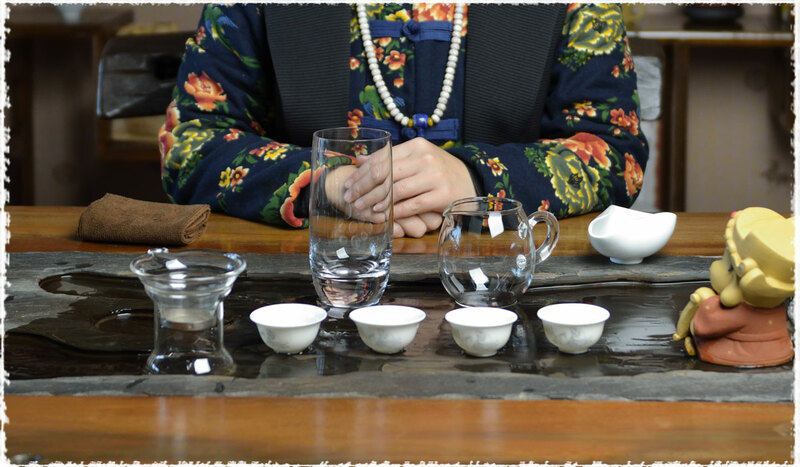 Pre-warm Glass: Pour some water in the glass cup to clean, sterilize and pre-warm it as well as the tea cups, and fair cup. Step 3. Cast the tea: Firstly, fill about 1/3 water in, and then add dry tea leaves. 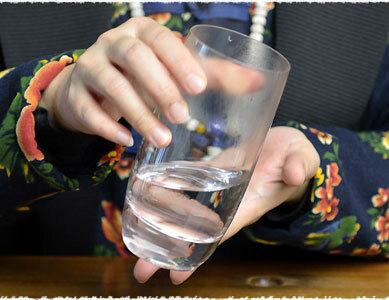 Gently shake the glass, and then pour about 70% cup of water. During this process, you can see the dance of the leaves as they unfurl and swirl around in the water. 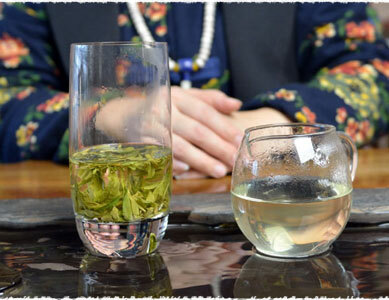 (The glass in the picture is 385ml, we pour 90ml water in first, and then add 180 ml water in after put the tea in). Note: the dragon well green tea we used is tender, so we’d suggest putting the tea in some water, and then filling more water. Step 4: Brewing time: You can pour out the tea liquid in the fair after about 3 minutes and serve the tea in the tea cups. If you drink alone, then you don’t need to use fair cup. 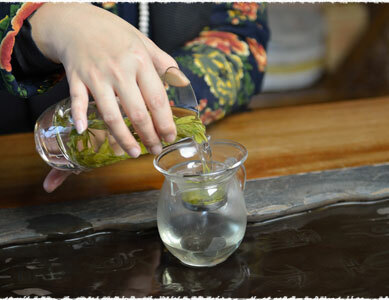 Usually the Dragon Well Green Tea can be brewed 2-3 times in this method. Every time the aroma and the taste are a little bit different. 1. 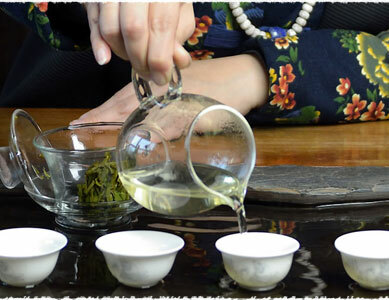 Dragon Well green tea is made of tender tea buds and leaves, it is not suitable for using boiling hot water. 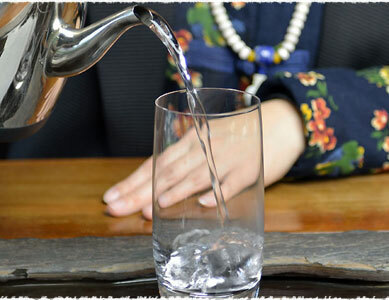 You can let the boiled water cool down for several minutes, and then pour it in the cup. The proper temperature is 80°C- 85°C( 176℉ to 185°F). 2.If you prefer strong taste, you may brew tea more than 3 minutes. Or add more than 2 grams tea leaves in. 3. Please leave about 1/3 tea liquid in the glass before you refill the water. In this way, your second steep will be better. 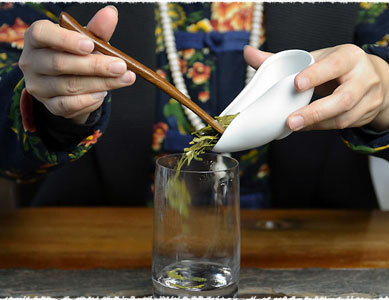 Step 1.Use a tea scoop to take 2 grams Dragon Well Green Tea from your tea tin (or bag), then put tea into tea holder. 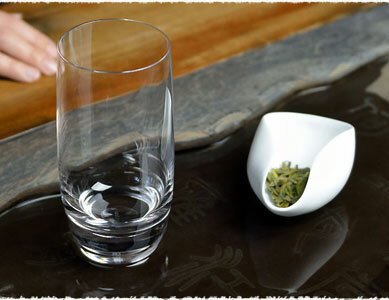 And show the tea holder to your guests to appreciate the beautiful appearance of tea leaves. 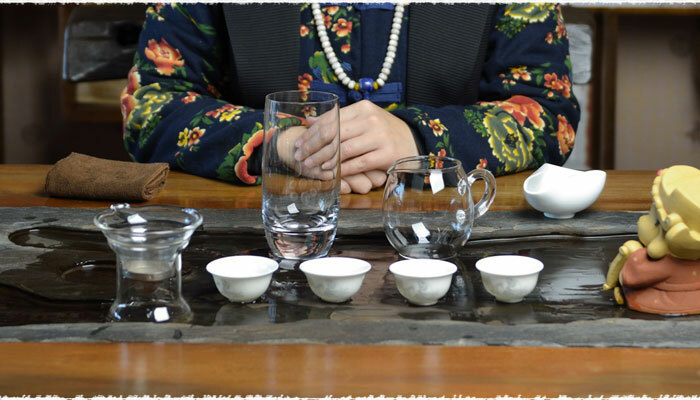 Step 2.Pour some water in the glass cup to clean, sterilize and pre-warm it as well as the tea cups, and fair cup. 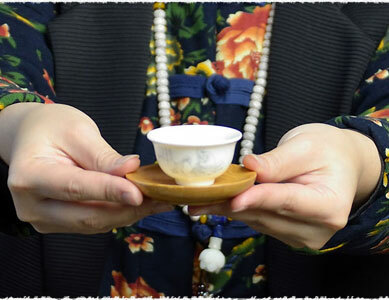 The fair cup is used to hold the well-brewed tea, then to pour the tea liquid into each cup with equal amounts into each guests cup, to represent that everyone is equally respected. Step 3. 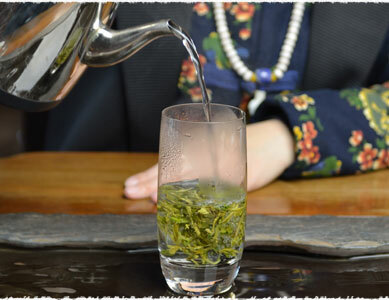 (optional) Pour some water on the Green tea, and then discard the liquid in about 2-3 seconds. This is called wash the tea. Note: For the high grade green tea or organic tea, you don’t need to wash the tea. 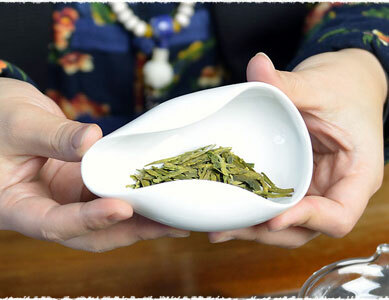 Step 4: Put the Dragon Well Green Tea in Gaiwan, and pour 176℉ warm water (about 1/3 of the Gaiwan) then turn it around several times in order to wet all of the Dragon Well green tea in the cup completely. This will draw the flavor out of the tea so you can smell and taste its freshness! 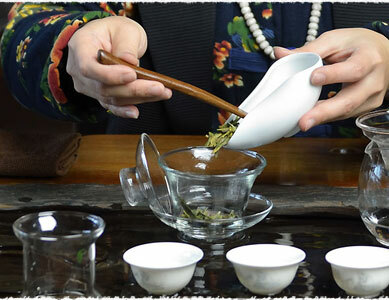 Step 5: Flush in hot water afterward to fill your Gaiwan and allow the leaves to completely unfurl. 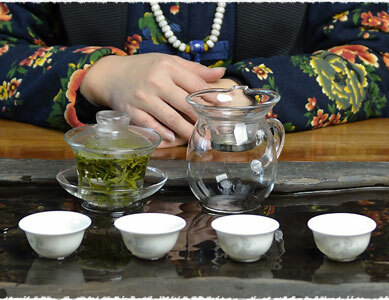 Note: if the green tea is high grade, you don’t need to cover your Gaiwan. Step 6: Brew the tea for about 20 seconds and pour out the liquid to your fair cup. Then share it with your friends. 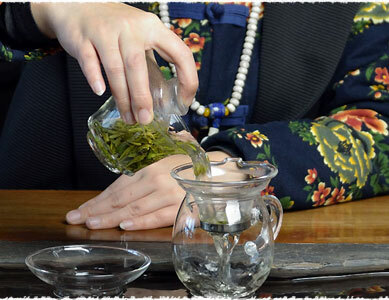 After finished the first steep, refill the warm water, and extend the brewing tea 10-20 seconds for every later steeps. 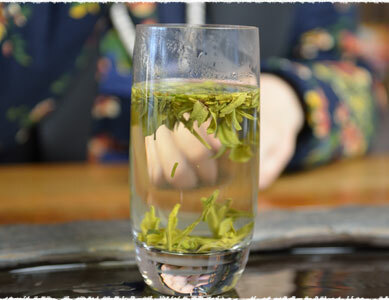 Usually the Dragon Well Green Tea can be brewed for about 3-4 times. How to steep black tea? I looked up “Dragonwell green tea steep time” and found your website. 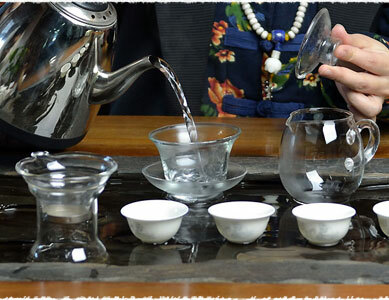 Thank you for the information and writing about how to do a Chinese or Gongfu tea ceremony. Hello Danielle, the effects of weight loss exists in all kinds of green teas, so theoretically you can drink any kinds of green tea. But newly made green tea, or green tea made of the first flush leavs, contains more aromatic compounds and catechinic acid, which has better effection on weight loss. To keep drinking green tea for a long time can be effective. Though it is slow, but it will be better for your health. Very nice find Aaron, this is something I have been lnikoog into trying to look to alternative drinks, specially for my morning coffee addiction.The problem I have is that I want to start drinking Green Tea but I have no clue what to take. There’s probably at least 300 or 400 products labeled Green Tea (Arizona Green Tea, Starbucks Green Tea, Lipton Green Tea, Green Tea gum, Green Tea mints!) and becomes a road block trying to decide which is going to be worth your money.What brands you guys recommend or have prestige of being a quality product? I want the good staff man, what’s good out there?I know a trip to Trader’s Joes or any organic store would narrow my search with a better selection but we all know that just because it’s organic doesn’t mean that it’s the best.Quite frankly I rather buy a box of Green Tea from the beauty salon where Priscilla has taken me to do her eyebrows even though the only words in English are Green Tea.Let me know what you guys recommend or take, I’m sure this is something a lot of people struggle with as well. 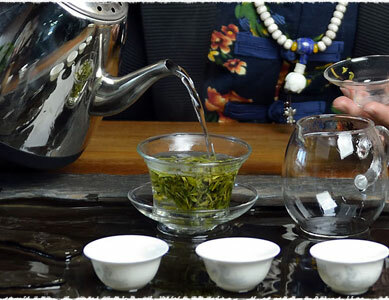 Thanks so much for your comment on our article: Brewing Chinese Top Grade Dragon Well Green Tea. As you said, there exists so many types or brand of green teas. To some degree, it is a little difficult for customer to select. 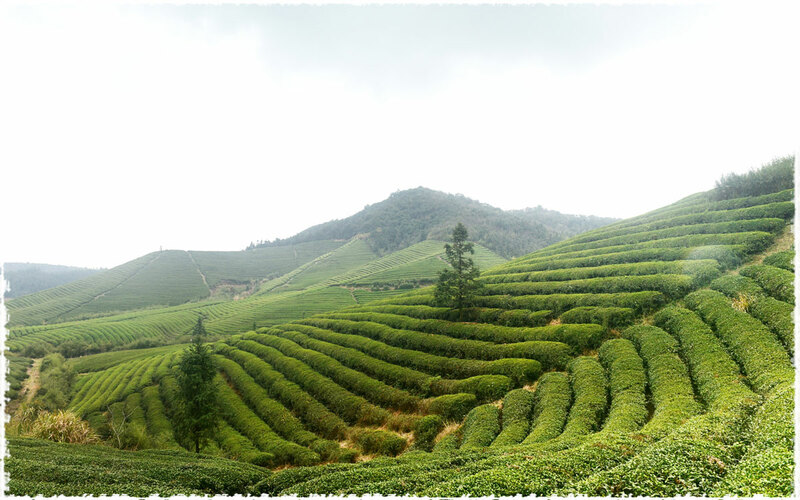 Green tea is well-known in china, even in Asia. 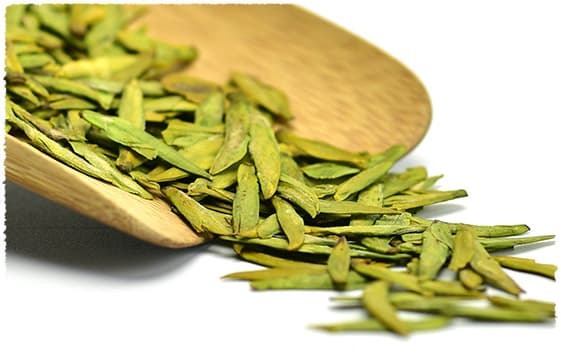 So if you want to enjoy the unflavored green tea, I can recommend you have a taste our premium dragon well, which is commonly regarded as one of China’s TOP ten tea, if you have a preference to green teas, maybe our Bi Luo Chun, Huangshang Maofeng, ect, are a good choice for you. While, if you’d like to explore the flavored green tea, I do think Jasmine Dragon Pearls are your best choice. As for organic or not, in my opinion, this is depend on your personal preference. For me, I just enjoy those teas which can satisfied my own taste buds, whatever it is organic or not. So enjoy your tea journey!